We know that fisheries bycatch is a major threat to marine mammals, but the real trouble is figuring out just how much of a threat it is for different species around the world. 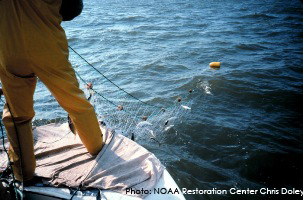 New England Aquarium researchers Kate McClellan and Tim Werner decided to find out how big the threat of bycatch is from gillnets, a major type of fishery worldwide. To evaluate the extent of the threat, they compiled data on bycatch from 1990 to 2010, from over 570 sources around the world, and verified by international experts. They found that at least 75 percent of toothed whale species, 64 percent of baleen whales, 66 percent of pinnipeds (like seals and sea lions) and all sirenians (manatees and dugongs) and marine otters have been recorded as gillnet bycatch over the past 20 years. It is difficult to draw conclusions about the real impact of fishery bycatch on most marine mammals because of data gaps in population abundances, bycatch rates, and other threats (like pollution or habitat destruction). Even though this study was quite comprehensive, it is only just scraping the surface of the bycatch problem. A lot more research is required. 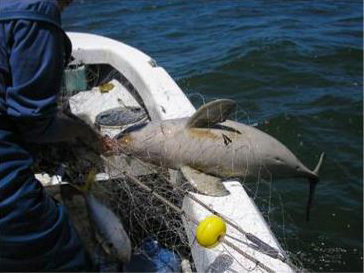 Marine mammal bycatch from gillnets is a problem around the world. Read the full published report in Endangered Species Research. And here's more information on this paper and the Consortium for Wildlife Bycatch Reduction, which is administered out of the New England Aquarium.